The yellow vest movement in France started with the increase in fuel taxes which President Emmanuel Macron announced to go in effect in January 1, 2019. This was part of his strategy for his environmental policy. However, as time has passed, the uproar for the repeal of the tax has become much broader. This protest began on November 17, 2018 and is still ongoing till this day, April 3, 2019. Yes, yellow vest. This movement got its name by the yellow vests that vehicles are required to have. During foggy seasons or times when it’s hard to see anything, and someone is parked on the side of the road, these yellow vests must be worn to be seen to avoid accidents. Now, these vests are the symbol for the protest ongoing for the unjust charges and taxes. At the beginning, the goal of the protests would be to cut down the over taxing. But now more and more problems have been brought up into the light that people are trying to fix. All in all the big picture would be social justice that is trying to be achieved through this movement. 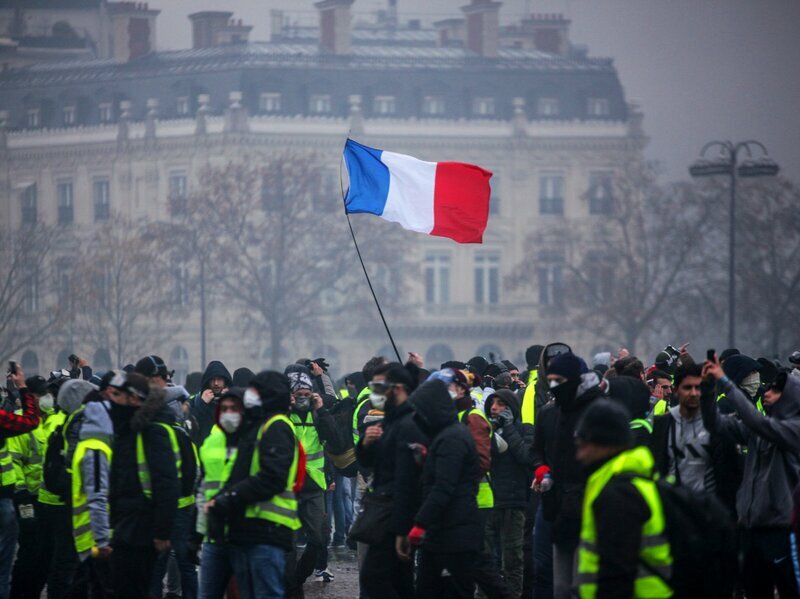 Thousands and thousands of people have turned up, put on their yellow vests, and filled the streets in support of the movement. Compared to other areas, it has become violent. In Paris, stores have been looted, cars set on fire, walls vandalized, and hundreds have become injured. Hundreds have also been taken into custody. The police have resorted to throwing tear gas and water cannons at the crowds. President Macron will have to find a way to fix the protests and calm down the anger that has spread. Hopefully, this problem will soon be resolved.